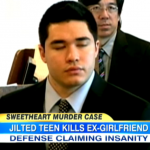 On this Valentine’s Day, Dan appeared on Good Morning America to discuss the case of love gone wrong: a Massachusetts teen accused of killing his high school sweetheart. Today, the defense claimed insanity. Dan explains what it all means: “The insanity defense is always hard. This is even harder, because this is what they’re calling a ‘single-psychotic episode.’ The insanity defense is easier to some degree when you’ve got someone with a real documented history of mental illness throughout his or her life. Here you have the defense saying you have someone with a family history of mental illness… So this is a tough defense here but remember the prosecution still has the burden to prove that he was not insane.” So what will happen? Dan predicts, “I think the best that the defense can hope for in this case is a second-degree murder conviction.” Watch video of the segment here.